Looking for deals in Glasgow? Well set in the Glasgow Central of Glasgow, ibis Styles Glasgow Centre West provides free WiFi and a shared lounge. Very clean and comfy, accomodating and helpful staff. Radisson RED hotel in Glagsow features 174 rooms, 3 event and games studios, Glasgow’s first official rooftop bar, a fitness room and 76 car parking spaces. This is the best hotel in Glasgow we have stayed in by far. Boasting a 24-hour front desk with express check-in/check-out, a bar and a restaurant, Hampton by Hilton Glasgow Central also features a fitness center. Sharp, clean, modern and comfortable place to stay in the centre of Glasgow. Would be happy to stay there again. With a stylish restaurant and bar, Hotel Indigo Glasgow offers boutique rooms with free Wi-Fi and luxury bathrooms. In Glasgow center, the hotel is just 1640 feet from Glasgow Central Station. What I liked most was how close it is to City Center. This magnificent, baronial building offers luxury bedrooms, a bar, restaurant and conference facilities that cater for up to 200 people. Wonderful. Great room with a view of the church across the street. Located near the SECC, SSE Hydro Arena and Clyde Auditorium, Village Hotel Glasgow offers free car parking. Rooms were very clean and bed was comfortable, air conditioning came in very useful. Located at Glasgow Central Station, the award-winning Grand Central Hotel is an iconic hotel set within Glasgow’s shopping district. Delicious breakfast. Helpful, friendly staff. Very large room. Next to the Central Train Station, the Grasshopper Hotel enjoys a great location in Glasgow. It offers rooms with sleek design and free Wi-Fi, and a Kitchen restaurant that uses the best local... Central location. Around the corner from Central Station, and airport bus stop very near. Crosshill House is located 2 miles from Glasgow city center, 1969 feet from Crosshill railway station with trains to the center every 10-15 minutes. The hotel is ideally situated in the Southside, we were visiting friends who lived nearby. This 4-star Holiday Inn is located in the heart of Glasgow, just 164 feet from the Royal Concert Hall. Excellent breakfast - scrambled egg was fabulous ! The Holiday Inn Express Glasgow Theatreland is well-placed in the city center, just a few yards from shops and nightlife. Excellent Staff very helpful, courtious and efficient. 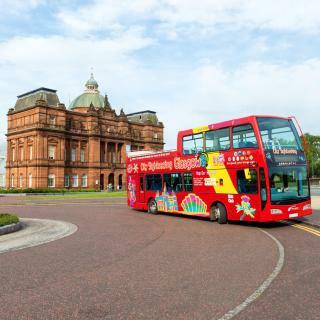 Located next to Glasgow Queen Street Rail Station and just 164 feet from Buchanan Street’s shops, this hotel has an airport bus stop directly outside. Lovely clean hotel and very central. Lovely cool rooms in the heat and lounge a great touch. 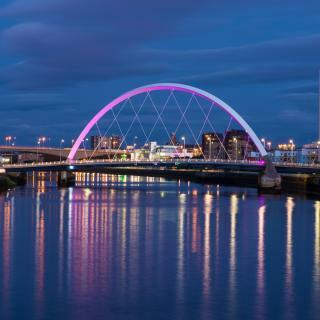 Featuring a restaurant and 24-hours front desk, this Premier Inn Glasgow Pacific Quay is on the banks of the River Clyde, less than 3 miles from Glasgow city center. Free parking is available on site.... Great rooms, fantastic location for the SECC and the underground to take you into the city. 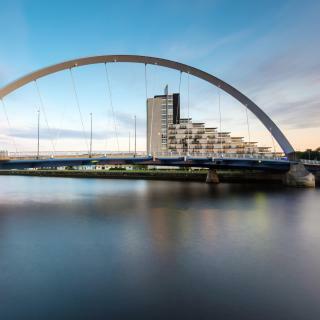 Only a few minutes’ walk from the SEC campus, the 4-star Crowne Plaza Glasgow overlooks the River Clyde. It has a leisure club with a pool and spa, as well as a maritime-inspired restaurant and bar. Good location next to the river. Taxi to the city Not expensive. The parkings in the city expensive. Which hotels in Glasgow have nice views? Cathedral House Hotel, Radisson RED Hotel, Glasgow, and Crowne Plaza Glasgow got great room view-related reviews from travelers in Glasgow. What are the best hotels in Glasgow near Glasgow Airport? Travelers who stayed in Glasgow near Glasgow Airport (GLA) have said good things about Holiday Inn - Glasgow Airport, Holiday Inn Express - Glasgow Airport, and Courtyard by Marriott Glasgow Airport. 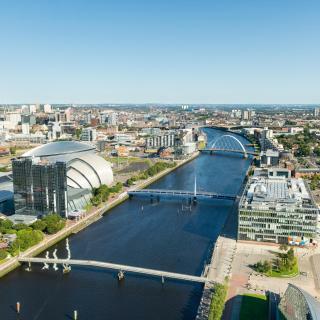 Which neighborhood is the best one to stay at in Glasgow? Central Glasgow, North West, and South are popular with other travelers visiting Glasgow. What are the best hotels in Glasgow near Hampden Park? Some of the best hotels in Glasgow near Hampden Park include Glasgow Hampden Garden Flat, Hampden Glasgow Tenement Flat and Number 10 Hotel. How much is a hotel in Glasgow for tonight? On average, it costs $70 per night to book a 3-star hotel in Glasgow for tonight. You'll pay around $109 if you choose to stay in a 4-star hotel tonight, while a 5-star hotel in Glasgow will cost around $156, on average (based on Booking.com prices). Which hotels in Glasgow are good for couples? These hotels in Glasgow are highly rated by couples: Cathedral House Hotel, ibis Styles Glasgow Centre West, and The Pipers' Tryst Hotel. How much does it cost to stay in a hotel in Glasgow? On average, 3-star hotels in Glasgow cost $76 per night, and 4-star hotels in Glasgow are $117 per night. If you're looking for something really special, a 5-star hotel in Glasgow can be found for $230 per night, on average (based on Booking.com prices). How much is a hotel in Glasgow for this weekend? The average price per night for a 3-star hotel in Glasgow this weekend is $194 or, for a 4-star hotel, $289. Looking for something even fancier? 5-star hotels in Glasgow for this weekend cost around $451 per night, on average (based on Booking.com prices). Which hotels are the best ones to stay at in Glasgow? ibis Styles Glasgow Centre West, Motel One Glasgow, and Dakota Glasgow are some of the popular hotels in Glasgow. Which hotels in Glasgow are good for families? Many families visiting Glasgow loved staying at ibis Styles Glasgow Centre West, Grasshopper Hotel Glasgow, and ibis Styles Glasgow Centre George Square. Which hotels in Glasgow offer an especially good breakfast? For hotels in Glasgow that serve highly-rated breakfasts, try Cathedral House Hotel, The Pipers' Tryst Hotel, and Sherbrooke Castle Hotel. 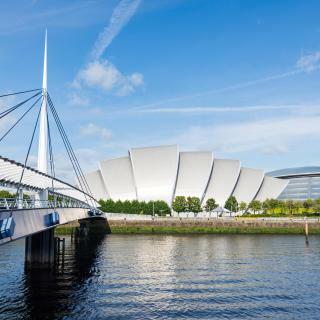 Scotland’s largest city, Glasgow combines Victorian architecture and a vibrant arts scene. A former European City of Culture, it is home to many national organizations including the Scottish Ballet and the National Theatre of Scotland. The museums are also world-class. 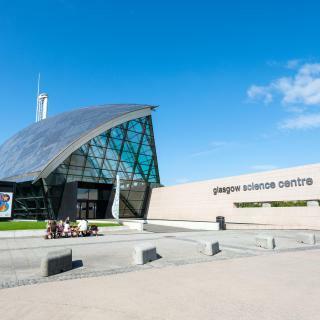 Don't miss the futuristic Glasgow Science Centre and the eclectic exhibits at the Kelvingrove. Lined with Georgian buildings, George Square is the city’s focal point and the spot for Glasgow Hogmanay celebrations. Fanning out from here are streets housing venues for the city’s main love: music. From classical concerts to up-and-coming bands, there's something for everybody. As host of the 2014 Commonwealth Games, Glasgow is also a city of sports. Scotland’s 2 iconic soccer clubs - Celtic and Rangers - are based here, as is the national soccer stadium, Hampden Park. The Scottish Football Museum is also an excellent walk through the beautiful game. Last but not least is the shopping in Glasgow. Shopping centers cover everything from name brands to international designers. So when you fly into Glasgow Airport, make sure you've left enough space in your bags! Complete your stay with one of Booking.com’s range of Glasgow hotels, apartments, B&Bs and hostels. Glasgow was the first stop on my Outlander tour of Scotland. Glasgow was the first stop on my Outlander tour of Scotland. The Z Hotel was very nice—well appointed room, helpful staff, and a delicious £10 breakfast. My pickup spot for my tour was just around the corner. Easy to walk the area around the hotel, and Waxy O’Connor’s Pub was a great place to spend the evening. The Cathedral is something not to miss! Very friendly people...music scene..Scotia and Clotha pubs especially. Pot Still whiskey pub also excellent. Not yet the right architectural mix on main avenues between historic Glasgow and the "new." Trongate the site of troops and tanks sent by Winston Churchill in 1919 to break a strike for a 40 hour week. Millennium Hotel place of historic 1941 meeting between Churchill and Harry Hopkins leading to America embracing defense of Britain. Churchill wept. There is a Hopkins Room in hotel, now business office of which hotel staff know almost nothing. Opportunity for city publicize this meeting. If you are only staying for one night as it's for to see a show at the SECC HYDRO but don't want to take the car plus if you wish to have a meal and brink before the show this hotel is great for the location as taxi's to the Hydro or restaurants are cheap only from £5-£7 depending on where you pick to go for a meal, it's more convenient if you pick the LaRonda restaurant as you can eat drink and walk to the hydro then taxi back to hotel and make a day/night even do some shopping before you leave the NCP the allocated car park for hotel for 24 hrs parking £12 you leave the NCP car park before the 24 hrs are up so take note of time of arrival which should be 15.00 check in time at hotel to 12pm check out time as your car park is paid 24hrs so you have until 2.45pm to drive off. Enjoy your stay at the Holiday Inn Express Riverside Hotel it's very welcoming and cheap. The front desk staff are welcoming. The front desk staff are welcoming.Relaxing atmosphere from the moment you walk in. easy check in.The room was comfortable and we were offered an upgrade from a king bed to two singles which suited me and my daughter better.so thanks to the front desk staff for offering this to us made our stay more comfortable. The room was comfortable and clean. although there were no robes and slippers in the room which we would have expected for a hotel of this standard. We get them in every hotel and unfortunately we did not bring slippers or robes with us which meant we had to dress in our clothes which we were going to wear into town that day down to the spa. We walked in our bare feet in changing room and around spa area. I did not feel comfortable with this. Towels lovely soft and clean. overall staff are of high standard in customer service. Been numerous times - we like to mix shopping with a bit of culture. Buchanan Street is fab for shops, we also like Byers Road great eclectic mix of vintage, high street and charity shops. The Hunterian Museum and MacKintosh Tour is a must, as is the Kelvingrove Museum and Glasgow School of Art (currently under renovation). House for an Art Lover (Bellahouston Park) is another place of interest, and also the Glasgow Tenement House. The Necropolis, Glasgow Cathedral and St Mungo Museum are also a must. Hotel Indigo, Raddson Blu, Grand Central Station Hotel and The Butterfly and Pig are all fab places for Champagne Afternoon Tea. The Charles Rennie Mackintosh Tea Rooms are a delightful experience also. Pubwise - The Corinthians and Citations are amazing and stunningly beautiful buildings as well as great pubs which are situated in the Merchant City area (well worth a visit) Cafe Cossachok is an amazing authentic Russian Restaurant and well worth a visit. We are going back next month, our son lives there so now we have a great excuse to keep going back. The staff from check in to the bar & restaurant were lovely and welcoming! Girl at reception friendly and helpful! Unsure of her name. We stayed over the one day Glasgow seen sunshine! An added bonus they have a terrace over looking the Clyde. Drinks prices not to expensive, what you’d expect in a bar city centre! We were supposed to go out but hotel atmosphere was that nice we just stayed in! Rooms were nice, clean and beds comfortable. Would definitely be my first choice for a night away again! Arrived early morning after an overnight flight from Canada and were able to check into our room immediately!! Very much appreciated after a long night. As we were walking everywhere during our two days in Glasgow, having a hotel in a central locale, was fantastic!! 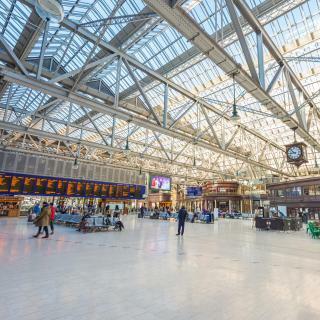 Just steps away from George Square and Glasgow Queen Street Station. A short walking distance to Glasgow Cathedral and the Necropolis. Our room was on the bottom floor at the back of the building, so was very quiet. The location of the hotel was excellent and it was very clean and well-priced. The staff were very friendly, welcoming and helpful with recommendations of where to go for food. I actually was not keen on staying in Glasgow (this was the last stop on our week-long trip) but it turned out to be a great city and I would definitely go back! I would actually also stay in this hotel again and would recommend it to friends and family. It was in a central area and right next to the bus station which was super convenient. The hotel was beautiful and the staff was very helpful but the rooms were very small and you can’t open the windows which gave me a little bit of claustrophobia. Aside from very small rooms the room itself was clean and the bed was comfy. So as long as you’re ok in small spaces this hotel is a great place to stay in Glasgow. Excellent Hotel that is well placed very close to Central Train Station in City Centre and gives easy access to Shops Pubs Theatres Eating places etc. Staff very pleasant and helpful. Room clean and comfortable. Excellent Buffet Breakfast with good choice range. Have booked again for a future visit to Glasgow. The hotel is well located in the proximity to the city centre, the parking facility is next door (Q-Park) and offers real good parking spaces with a 25% reduction for hotel guests. We are sorry to say that these are the only positive aspects of our stay at the Fraser Suites in Glasgow. The hotel staff where extremely attentive and very welcoming upon arrival. Room was clean and tidy with a great view over Glasgow city centre. Slept really well both nights as the beds where very comfortable. Ideally situated for anyone visiting Glasgow city centre. The hotel is in the best location in Glasgow. Right in George Square. Access to everything on foot, by car, trains and buses. The staff are happy to see you and bend over backwards to assist. Food in dining area was very good. The hotel was very central, the location was perfect. Rooms were very clean. Bathroom was very clean. Very affordable for city centre Glasgow. Super central location especiallyif you use train to get to Glasgow. Typical old and cozy european hotel with modern amenities. Hotel is situated at prime location, i.e. next to Glasgow train station and is also near the city center. Very nice contemporary hotel. Good restaurant. Great location by Central Station, Glasgow. It was close to and within walking distance of our planned activities. Great food in the restaurant and bar on the property. Near george square, very clean and comfortable. So worth the price! Stayed in a private room and was excellent for the price.